In humans, thyroid diseases are accompanied by alterations in the plasma lipoproteins. Hypothyroidism is associated with hypercholesterolemia and an increased risk for atherosclerosis (1). The concentrations of apolipoprotein B and LDL cholesterol are elevated (Table 1), and the choles terol net transport between cultured fibroblasts and the plasma of hypo thyroid patients is dramatically decreased (2,3). In hypothyroidism, HDL cholesterol has been reported to be normal or elevated. Apo A-I is very often increased while apo A-II remains in the normal range (2,4). Conversely, the plasma concentrations of HDL cholesterol and apo A-I are decreased in hyperthyroid patients (5,6). Therefore, thyroid diseases constitute paradoxical situations where HDL cholesterol increases with the atheromatous risk. It has been shown that both in hypo-and hyperthyroidism, the variations in the HDL2 subfraction account for the most part of the total HDL changes (4,5). These abnormal HDL profiles have been tentatively explained on the basis of two findings. Firstly, it has been shown that the HDL clearance rate is decreased in hypothyroidism (1). Secundly, thyroid hormones have been demonstrated to stimulate the hepatic lipase (HL) activity which is known to be involved in the transformation of HDL2 to HDL3 (6,7). 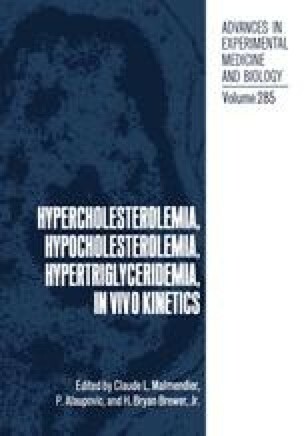 Therefore, the increase or decrease of the HDL2/HDL3 ratio respectively observed in hypo-and hyperthyroidism might be due to the variations of HL activity resulting from the changes of thyroid hormone concentrations.